Join My Team - The Inklings! Once upon a time, going to see a gig meant seeing Manic Street Preachers or the Stereophonics, nowadays it means going to see Andy from CBeebies perform with his comedy partner Mike! I spent this afternoon in a very modern church hall (it used to be a warehouse) with 100 other toddlers and their familes watching Andy and Mike's Big Box of Bananas, and I have to say that I throughly enjoyed it! I just took my eldest son as I wasn't sure that my youngest would have sat all the way through it, but Robert loved every moment of it - especially the funny noises - amazing how a noise that sounds like a fart can always get a laugh! Robert got two more signatures for his autograph book and I got some slightly blurry photographs to hopefully make a great scrapbook layout! I'll try and upload a couple of photos tomorrow. In the meantime I really need to finish my ILWS wedding card invite swaps! I was singing along as much as he was! The joys of motherhood eh? You should have heard me screaming with glee when the water pistol came out! Hello! My name is Emma and I am married to my lovely husband Rich and have two little boys. I love card making and scrapbooking, and anything else paper related! All stamped images are copyright Stampin' Up 1999-2012. Thank you for popping by my blog dedicated to all things Stampin Up! I hope that you find something that you like here that inspires you to get creative. Would you like to know more about Stampin' Up!, order some of their wonderful products or maybe have a workshop in your house with the potential to gain free stamps? Or even join my team, The Inklings? If so, drop me an email at emmakray@yahoo.co.uk . If you'd like to book a workshop or want to place an order, please contact me. All images are (C) Stampin' Up! Do you want another sneak peak? Reading Training - thanks girls! The content of this blog is my sole responsibility as an independent Stampin' Up! 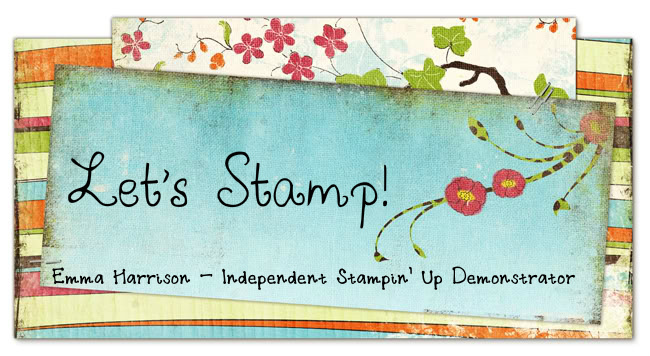 demonstrator and the use of and content of the classes, services, or products offered on this blog, is not endorsed by Stampin' Up! All content, including text, photographs and projects are (C) Emma Harrison. My artwork is shared for your personal inspiration and enjoyment and is not intended for submission to contests, publication or for personal monetary gain.